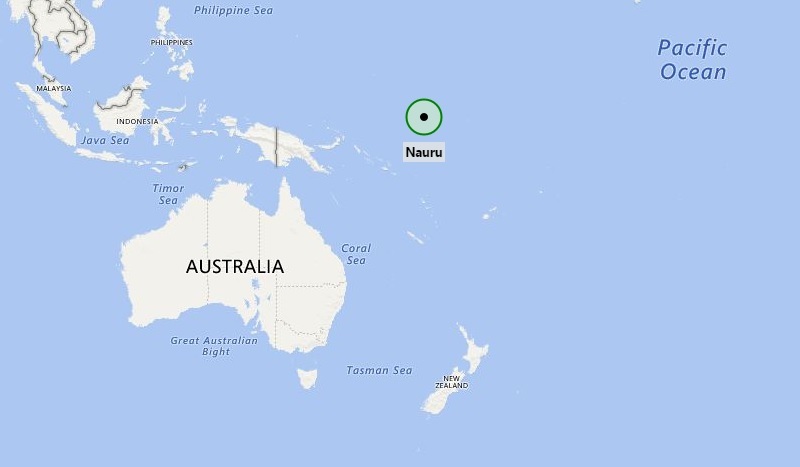 About Map: Map showing Location of Nauru in the Oceania Continent. Where is Nauru located on the world map? The given Nauru location map shows that Nauru is located in the South Pacific Ocean. Nauru map also shows that it is part of the Pacific Islands group Micronesia. Nauru is the world’s smallest island nation that formerly was known as Pleasant Island. Banaba island of Kiribati, situated about 300 km east is the nearest neighbor of Nauru. Nauru got its independence in the year 1968. The government type of Nauru is a republic with a parliamentary system of government. In this political system, the president is use to be the head of state as well as head of government. There is a unicameral parliament constituted of 18 members. They are elected for three years. Interestingly, Nauru is a phosphate rock island where phosphate deposits close to the surface and it has been exploited by the simple strip mining operations. Likewise, its economy is largely depends upon the export of phosphate. However, since the natural resource Phosphate is limited, the government of Nauru has resorted another source of income; resultantly, Nauru became a tax haven and illegal money laundering place. Later on its economy is become dependent largely upon foreign aid.